Hooray for soup season! Add soup to the growing list of things I’m appreciating more as I march through my forties. It’s right up there with slippers, Lawrence Welk reruns, cardigans, and butterscotch candies. I’m sure Bingo is just around the corner for me. As soon as I saw this come across my Facebook feed, I knew it was a winner. 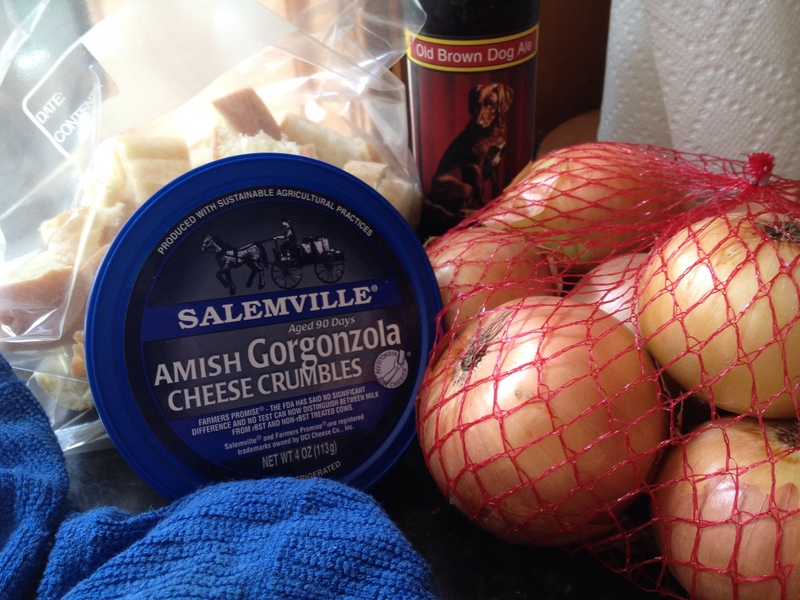 Onions + Beer + Cheese + Croutons? Sign me up! All I needed was a day off from work and a little cool weather, and I was ready to pounce. This recipe is almost too easy. While the onions are a tad time consuming since you cook the hell out of them, the rest of it almost feels like cheating. But I am not complaining! This soup has a surprisingly sweet and layered complexity of a recipe that requires much more effort. 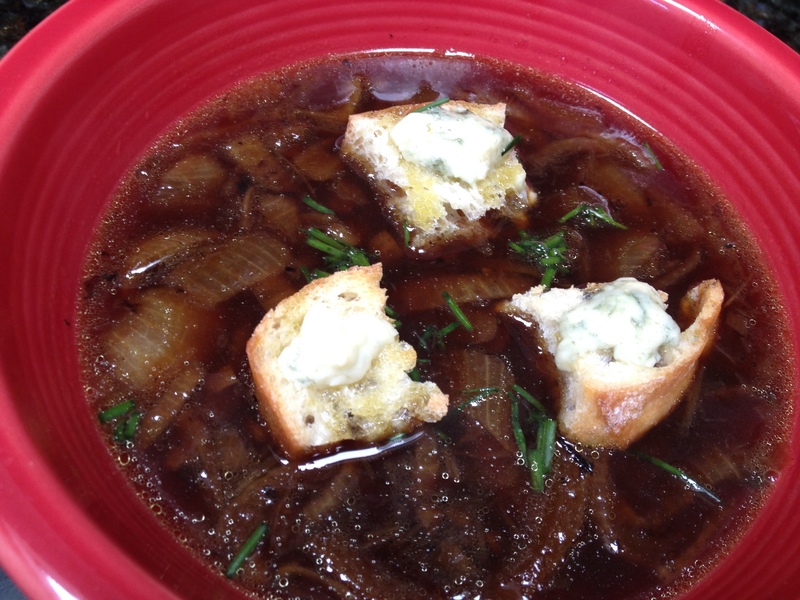 Definitely a fun twist on traditional French onion soup. Heat 2 Tbs. of the olive oil in a 5-quart Dutch oven or other heavy-duty pot over medium-high heat until shimmering hot. Add the onions and reduce the heat to medium. Cook without stirring until the bottom of the pot begins to brown, 5 to 7 minutes. Sprinkle with 1/4 tsp. salt and stir with a wooden spatula. Continue to cook, stirring and scraping the bottom of the pot frequently and adjusting the heat as necessary, until the onions are well browned, 20 to 30 minutes. Add the ale and bring to a boil over high heat. Reduce the heat slightly and cook at a vigorous simmer until all but a thin layer of the ale has evaporated, about 2 minutes. Add the chicken and beef broths and bring to a boil. Lower the heat and simmer for 10 minutes to allow the flavors to blend. Meanwhile, on a rimmed baking sheet, toss the bread cubes with the remaining 2 Tbs. olive oil. Spread the bread in a single layer and bake until golden, 10 to 12 minutes. 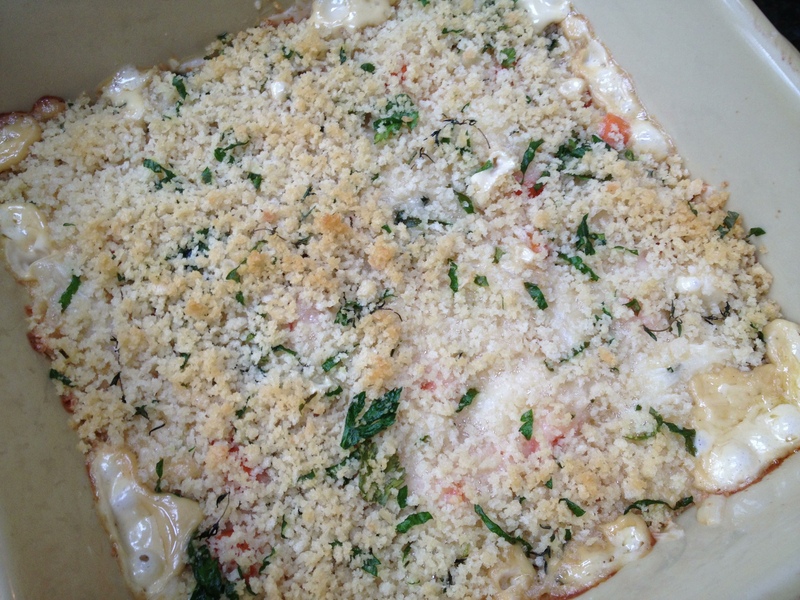 Remove from the oven, push the bread cubes closely together, and sprinkle with the cheese. Bake until the cheese has melted, about 3 minutes. Let cool slightly. Season the soup with salt and pepper to taste. Serve with the croutons and a sprinkling of the chives. Recently Cook’s Country magazine arrived in the mail for the first time, and I think it has potential to be a good one. As a subscriber of the now defunct Cook’s Illustrated Entertaining editions, I am assuming this magazine was sent in its place. Slowly but surely, life is starting to feel normal again. Well, normalish. Normalish enough that I actually opened up the magazine and looked at some recipes instead of filing it away unread. Any progress is good progress, right? Of course I went to the quick and easy recipes first. I try to do a lot of my cooking and food prep in the morning before work, because I’m not usually home until 7:00 pm — and by then, I’m in no shape to tie my shoes let alone work with fire. A recipe like this is right up my alley: fresh, flavorful, one pot, and with some added protein, it’s a complete meal. It looked way too beige for my liking, so I added some cherry tomatoes. Since I also added a bit of arugula, I skipped the basil in the original recipe, but that might be preferable if you are just using spinach. This is both good served warm and at room temperature, and a nice change from the normal pasta salads we see this time of year. 1. Bring 4 quarts water to boil in Dutch oven. Add penne and 1 tablespoon salt and cook, stirring often, until al dente. Reserve 3/4 cup cooking water, then drain penne. 2. Heat oil in now empty pot over medium-high heat until shimmering. Add leeks and 1 teaspoon salt and cook until softened, about 3 minutes. Add garlic and cook until fragrant, about 30 seconds. Add squash and 1/4 cup reserved cooking water and cook, covered, until squash is tender, about 4 minutes. 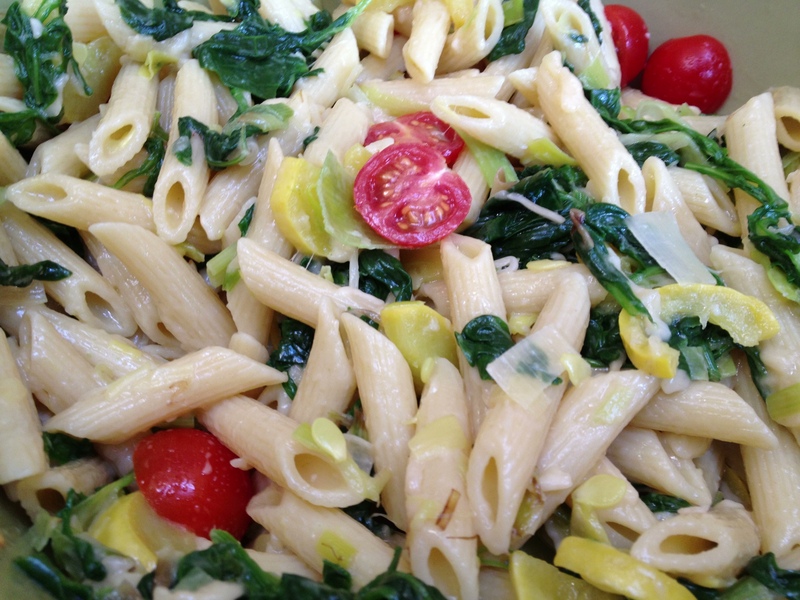 Stir in penne, spinach, Parmesan, tomatoes, remaining 1/2 cup reserved cooking water, and butter until combined. 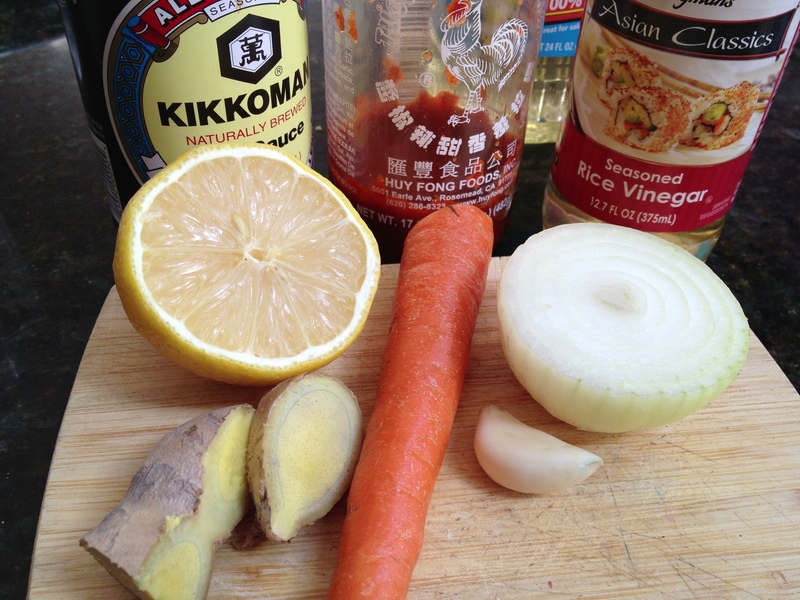 Add cooked chicken, salmon or shrimp, if using. Remove from heat and season with salt and pepper to taste. Serve, passing extra Parmesan separately. For the first time in what feels like many weeks, I was inspired to cook, and I have my original blogging inspiration to thank. Luisa from The Wednesday Chef posted this recipe, and it immediately grabbed me. It’s been a long while since I had that I-must-try-this-tonight feeling, and it’s good to have it return. I missed you, apron. Transitions are always hard for me, and even though I’m very blessed to have a great work environment and lots of support on the homefront, I still struggle mightily with change. Eventually I get my bearings and wind up exactly where I belong, but it’s not always an easy journey. I celebrated my 45th birthday yesterday. I have loved my forties so far and agree with everyone who told me it’s a great decade: lots of wisdom, and no time for nonsense. My only complaint is that the past five years really zoomed by, and at this rate I will be fifty before I know it. Not that that’s so terrible (as they say, better than the alternative), but I am always amazed at how each year goes by quicker than the last once you hit a certain age. Both at my very first job and my current job, I see a lot of fabulous, vibrant people in their seventies and eighties, so I know the party isn’t necessarily over just quite yet. I was off the last two days and managed to pack in a lot of fun. Caught up on my Real Housewives of Beverly Hills while folding loads of laundry, just like the good old days. Had two long lunches with two different friends. Browsed Target, my former home away from home, at a leisurely pace. 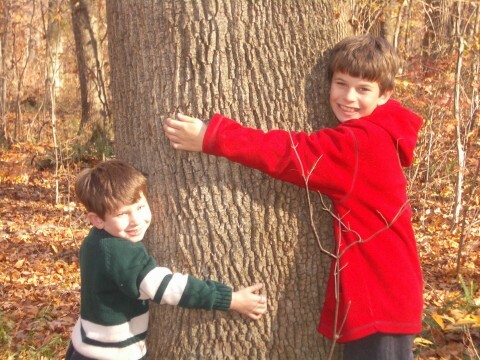 And, finally, blogged. This is a very forgiving recipe which lends itself easily to variations. Sambal Oelek is this stuff, and it’s stocked in all my grocery stores (even the super white bready ones). I used pancetta, but you can omit it or use bacon. 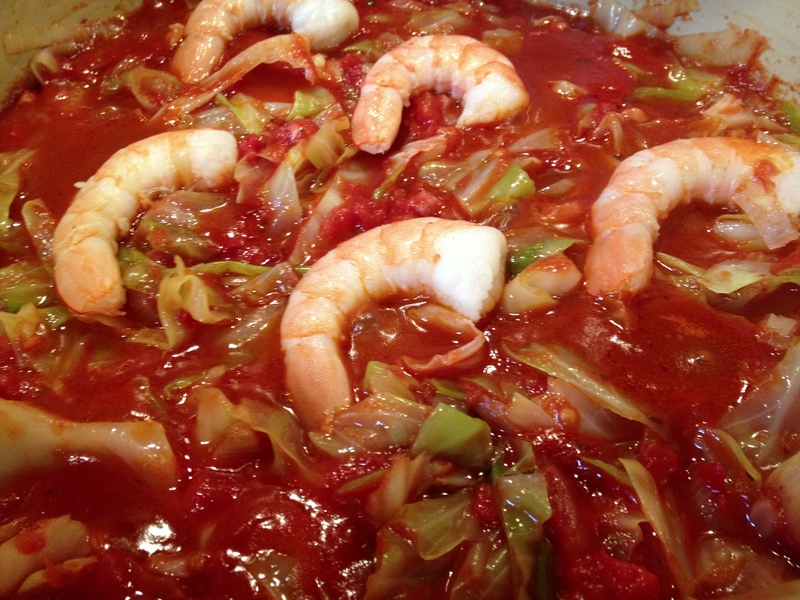 I used shrimp, but you can omit it or add another meat, chicken or shellfish. Luisa’s version is slightly different but I am sure equally easy and delicious. Serve with a hearty bread and call it a meal. In a large Dutch oven, heat oil over medium high heat and add chopped onion. Once softened, add pancetta and cook until brown. 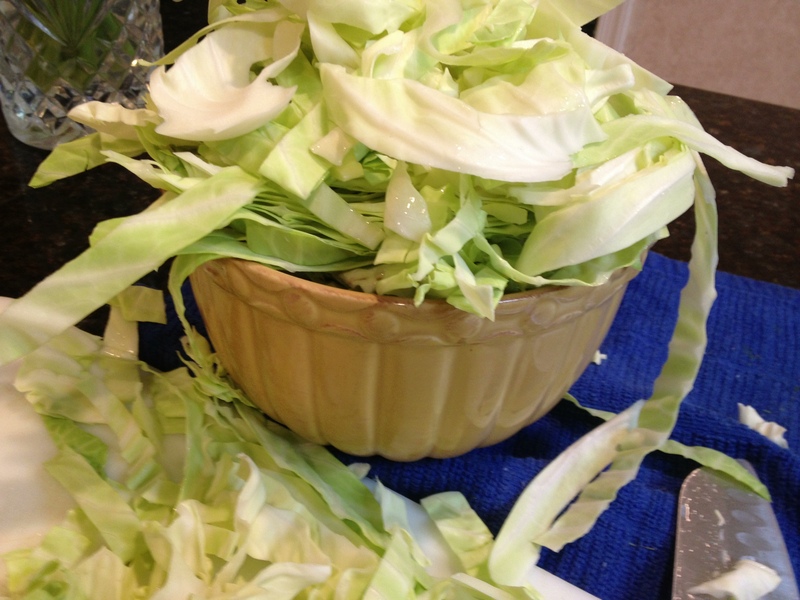 Add cabbage and cook for ten minutes, stirring often. Add tomatoes, salt, and sambal oelek. Cover and lower heat for about ten minutes. Add cooked shrimp or other meat and serve. The above picture is for my long-suffering Ed, who has dealt with my spatial challenges for over twenty years. Clearly he wasn’t home for me to ask, “Will this all fit in that bowl?” Note: Nine times out of ten, the answer is usually no. There are few things I dislike more than salad bars and buffets. Public restrooms come to mind, but otherwise, I’m drawing a blank. So I’m not quite sure what came over me last week when I was drawn to the salad bar of my grocery store in an almost supernatural pull, equal parts hungry and lazy. Plastic clam shell container in hand, belly up to the Acme salad bar, I found myself evaluating my many rainbow colored options. It seems the middle-aged crisis manifests in many forms. Obvious sanitation concerns aside, I become paralyzed by the selection process. Too many choices give me anxiety and harken me back to the days of toddler temper tantrums, where my children would melt down picking out what color cup to choose or a pack of gum at the checkout counter if I “rushed” them. Just. Pick. Something. Dammit. I’m not saying I would have been happier in the days of Soviet Russia, but standing there contemplating the selection of egg salad and broccoli salad and beet salad and bacon — so much bacon in all of the “salads” — and some rather flaccid looking veggies and ten different dressings and six different crunchy toppings and none of it made sense when served together in one container all touching each other that I wondered if I wouldn’t have been better off going next door to Bravo and ordering a cheesesteak for probably less calories than my salad. But oftentimes inspiration strikes in the most unlikely places. One of the many things I plopped in my container that day was a little sample of wheat berry salad, and this alone was worth my ordeal. Hearty and flavorful, I was immediately enchanted with the humble wheat berry, which is high in fiber and rich in nutrients. Score one for the Acme salad bar. 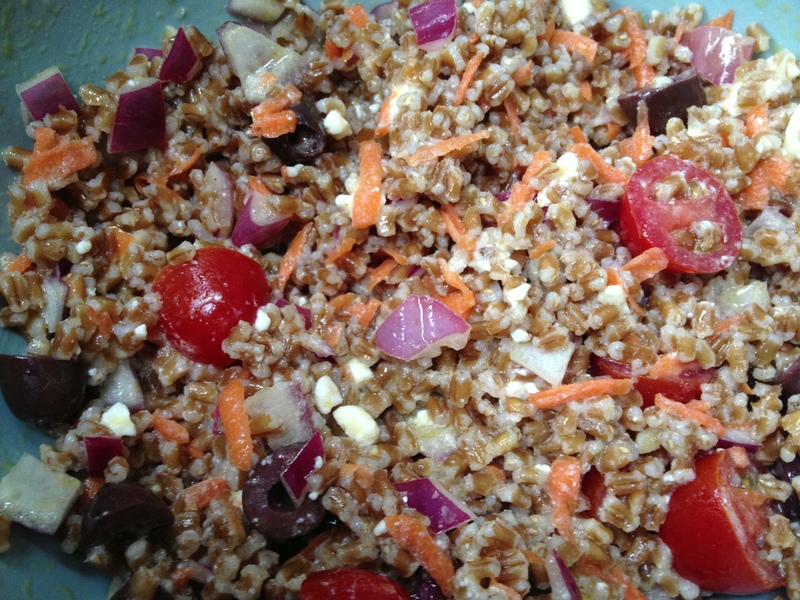 I picked up these wheat berries from Wegman’s (but certainly use any brand or variety you can find), and I set out to create something healthy, delicious and satisfying for lunch. Mission accomplished. If you’re gluten-free, quinoa or brown rice would work. Cook one cup of wheat berries per package instructions and remove from heat. In medium serving bowl, whisk together olive oil, apple cider vinegar and kosher salt. Add cooked wheat berries and mix well. 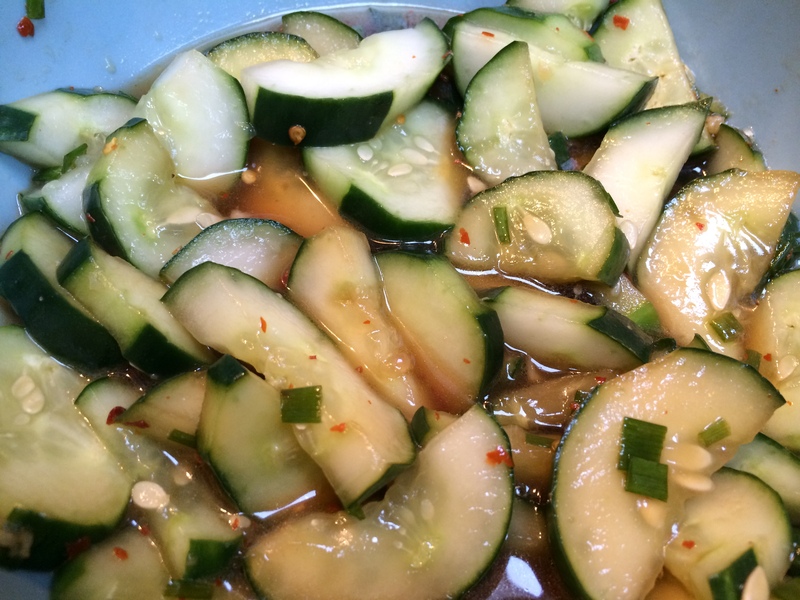 Add all remaining ingredients, gently combine, and serve chilled or at room temperature. Refrigerate and use within three days. I’ve had my eye on this recipe from my December 2012 Fine Cooking for a few months, and I finally decided to make it last week. 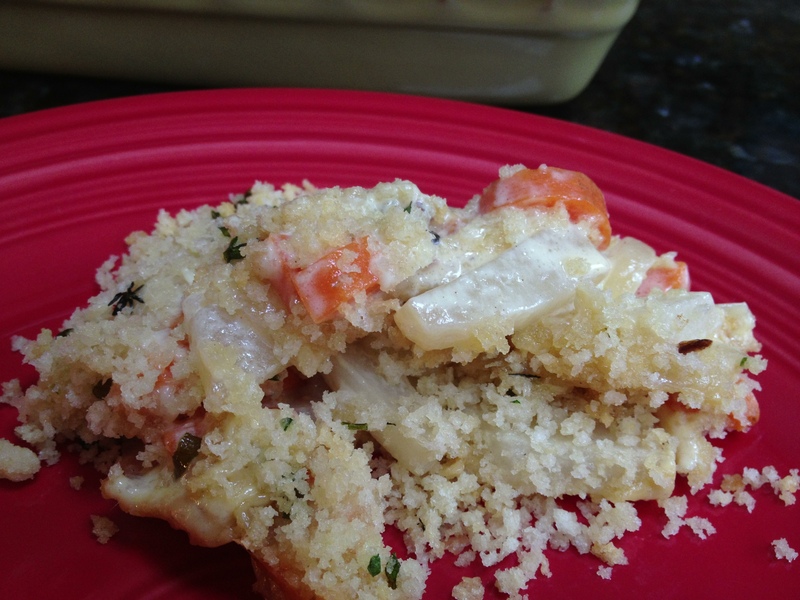 No surprise, carrots covered in heavy cream, butter, cheddar cheese and panko were a big hit. Obviously, almost any vegetable covered with these ingredients would be a big hit, so go ahead and modify if you wish. Then you can be one of those braggy playground moms who says, “Connor just LOVES when I make <insert one> turnips, broccoli, parsnips, kale, etc.” They don’t need to know the whole story. 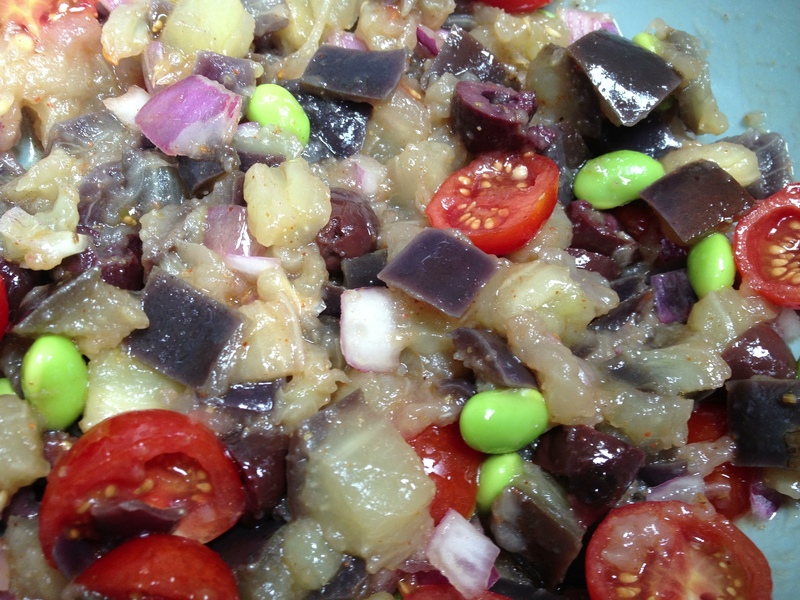 All kidding aside, this would make a lovely side dish for a holiday meal or a Sunday dinner. I was short on carrots and had a daikon radish which wasn’t getting any younger, so I threw that in there to make up for the carrot shortfall. You can also substitute parsnips for half the carrots. Position a rack in the center of the oven and heat the oven to 350°F. Butter a 9×13-in. (or similar) baking dish. In a 12-in. skillet, heat the oil over medium-high heat. Add the onion and 1/2 tsp. salt and cook, stirring occasionally with a wooden spatula, until golden-brown, 7 to 10 minutes. Meanwhile, melt the butter and pour into a medium bowl. Add the panko, parsley, and thyme and toss well. Whisk the heavy cream, mustard, 1-1/2 tsp. salt, and 1/4 tsp. pepper into the onion, scraping up any browned bits, and then stir in the carrots. Bring just to a boil, cover, lower the heat to medium low, and simmer until the carrots are crisp-tender, 10 to 12 minutes. 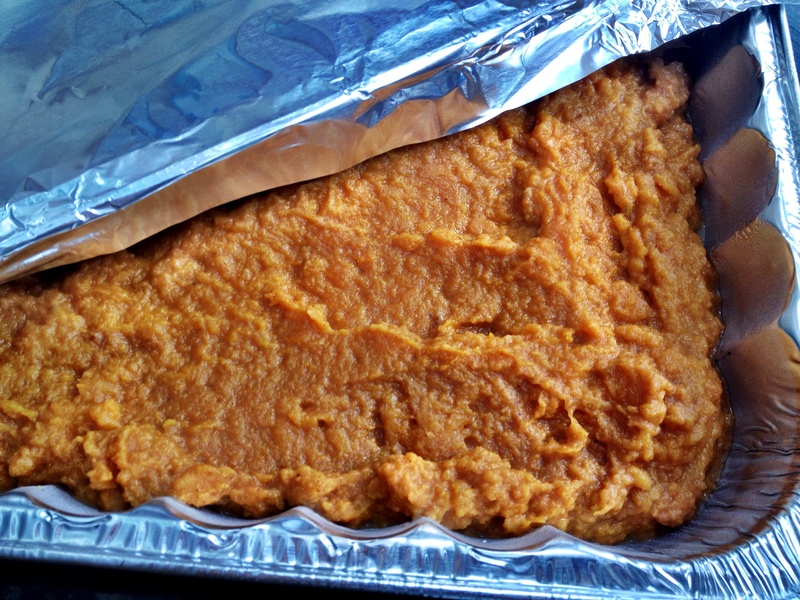 Spread the carrot mixture evenly in the prepared dish. Scatter the Cheddar over the carrots, top with the panko mixture, and bake until the carrots are tender when pierced with a fork and the crumbs are golden-brown, 30 to 40 minutes. Our family has been hit hard with illness this month, but we are finally emerging from the fog of norovirus, flu, bronchitis and pneumonia. It feels so good not to feel bad! I tend to be a tad melodramatic and channel Emily from Thornton Wilder’s classic American play Our Town whenever I’m very sick, proclaiming my love and appreciation for all the ordinary things in life from beyond my imaginary grave: Mama’s sunflowers, food and coffee, new ironed dresses and hot baths….and sleeping and waking up! (Not that I’ve seen an iron or a dress in many years myself). Even the little mundane tasks like dishes, laundry and grocery shopping felt wonderful to accomplish once my energy returned. As I languished in my sick bed, I made a commitment to healthier living. More salads, less cookies. I made this dressing for the first time last month in an effort to replicate the ginger dressing served at our favorite sushi place. Even though I didn’t hit the mark exactly, I’m still very pleased with the results. I made some again today and tweaked it a bit further. 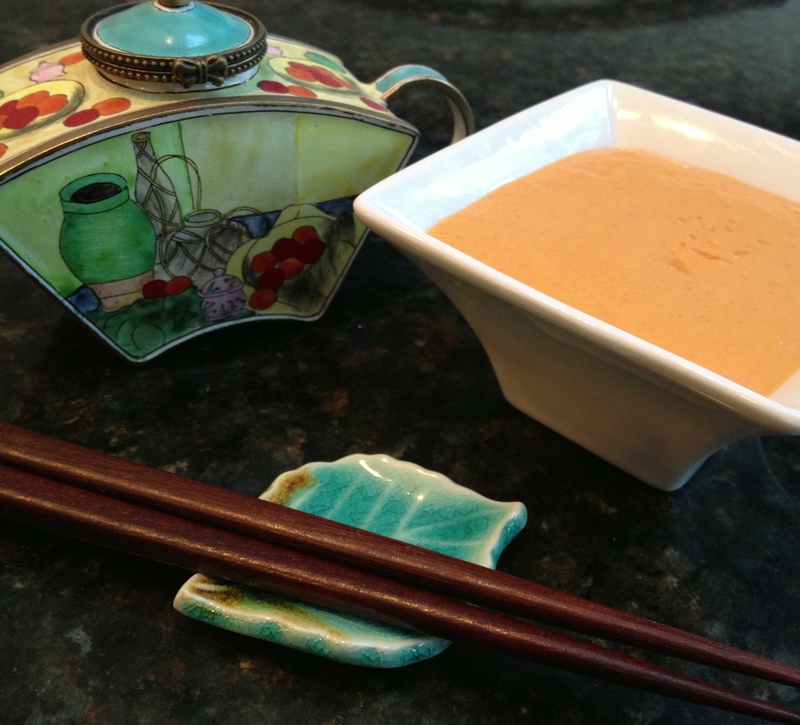 The peanut oil really gives it a nice richness and body, but there is only a 1/4 cup of it, so it’s not too unhealthy — especially compared to bottled dressings. In a heavy duty blender or food processor, combine all ingredients until smooth. Perhaps you, like me, feel a bit of detoxing is in order after six solid weeks of turkey, wine, cheese, cookies, chocolate, ham, ham, ham, more wine, eggnog, more cheese and a splash or two of limoncello. With January now upon us, the party is officially over. It’s time to clean up our act or purchase larger clothes. I’ve learned years ago to write my New Year’s Resolutions with the savvy of a trial lawyer — vaguely and with plenty of loopholes. For example, “Eat more vegetables.” I can do that! After feeling utterly unsatisfied after today’s lunch of Lean Cuisine spring rolls, I decided to play around a bit with some Brussels sprouts. The maple glaze is courtesy of Weight Watchers, but don’t be alarmed. I’ve still managed to trash it up a bit. Who says eating more vegetables has to be dull and tasteless? Heat oven to 450 degrees. On baking sheet, drizzle Brussels sprouts with olive oil and sprinkle with salt. Toss to coat well. After about 10 minutes in oven, give a good stir and roast another 5 to 10 minutes. In small saucepan, heat maple syrup and balsamic vinegar over medium heat for about five minutes. Add a pinch of kosher salt and stir well. 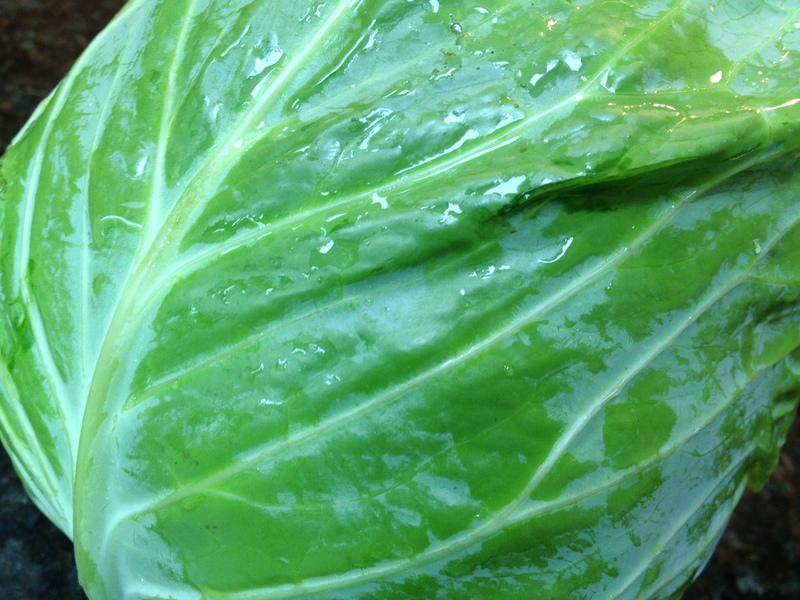 Drizzle on top of Brussels sprouts, and add Gorgonzola if desired. Trust me, it will be desired.